HEC Academy is a public day special education program that offers a small-school learning environment for high school students with learning disabilities and/or social, emotional, or behavioral challenges. We offer a structured, consistent, emotionally supportive environment based on positive reinforcement. Students work individually and in small groups on academics, social skills, recreation and community service, and earn credits towards high school graduation from their sending schools. We work to provide our students with the tools, knowledge, and support they need to fully reach their potential, in school and in the community at large. CES programs are approved by the Massachusetts Department of Education. At HEC Academy, we believe in the inherent potential and capacity of our students to learn, grow, and develop to the best of their ability. To accomplish this, we provide a learning community that offers a broad range of evidence-based academic and therapeutic supports for our students that are strengths-based, empowering and affirmative in nature. We design our classroom activities and behavioral supports in all our programs so that students are rewarded for what they are doing right rather than punished for what they are doing wrong. We believe this approach supports students to develop a positive attitude toward learning so they can find success in their school work, social relationships and future work experience. The goal is for students to obtain a high school diploma and transition to post-secondary education and/or employment. 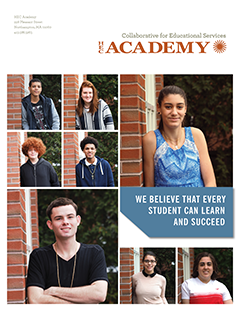 HEC Academy is designed for high school age students with a wide range of learning styles and needs, and who have Individualized Education Plans (IEPs) in place from their sending school districts. Students at HEC Academy generally have average to above average cognitive ability, and have demonstrated the need for more intensive levels of academic, social and emotional support than most public schools can provide. Students at HEC Academy typically have learning disabilities, autism, and/or social-emotional or behavioral challenges. HEC Academy is not an appropriate placement for students who require any level of physical intervention. Supervised by the Program Coordinator, the staff includes Special Education Teachers, Content Teachers, an on-site Clinician/Counselor, Assistant Teachers, Paraprofessionals and Specialists. Additional 1:1 support may be provided on an interim basis at the request of the referring school district. Throughout the day, an on-site clinician/counselor is available to provide ongoing, informal counseling; and if enrolled more than 30 days, students participate in a weekly session with a licensed therapist. Related clinical specialist services are incorporated based on individual student needs. To learn more about enrollment and referral of students to our programs, visit our enrollment page. What's best about our programs? "In the last few years, the Northampton School District has had the occasion to move a number of students from a highly restrictive placement to HEC Academy. The redesign and implementation of the therapeutic program in the school has had a profoundly positive impact on those students and others that were placed there directly from the public school setting. In addition, the collaboration between the educators and the clinical providers serves to facilitate student growth in a global manner beyond just moving them toward graduation. I honestly feel that HEC Academy has become one of the strongest programs in the Pioneer Valley for students with an emotional disability."